Color HiRISE image of the central peak of Leighton Crater showing inter-layered carbonate (light colored) and chlorite (dark colored) units. These rocks suggest that inter-layered carbonate and clay sediments have been metamorphosed at depth due to hydrothermal conditions. An ancient meteor strike on Mars has revealed the firstdirect evidence of how warm liquid water may have shaped a habitableunderground environment. Images taken by NASA's Mars Reconnaissance Orbiter haverevealed the first carbonaterocks found inside Leighton Crater at a level that was once buried 4 miles(6 km) below the red planet's surface. This first-time discovery of carbonates in an undergroundlocation points to a warmer epoch in the ancient Martian past with moreatmospheric carbon dioxide, as well as ancientseas. The carbonates also turned up alongside silicate minerals and clays thatsuggest the presence of hydrothermal systems — similar to the deep sea vents onEarth. "This discovery doesn't really hint at life, but itdoes reveal a very strong candidate for a habitable environment, perhapsthe best discovered so far," said Paul Niles, a planetary geologist withthe NASA Johnson Space Center in Houston. The ancient rocks may date back as far as 3.5 or 4 billionyears, according to Joseph Michalski, a planetary geologist at the PlanetaryScience Institute in Arizona. That means they don't necessarily reflect theMartian underground as it exists today, but they do point to processes whichcould make the Mars subsurface a habitable place. Researchers have long looked to the underground environmentin hopes of finding Martian life, because cold, dry conditions coupled with ultravioletradiation on the surface of Mars makes existence up above unlikely. "The subsurface environment provides a warm,stable environment that should be conducive for life to evolve given ourlimited understanding of that process," Niles said in an e-mail. The research is detailed in the Oct. 10 issue of the journalNature Geosciences. The findings may also prove a huge step toward solving the mysteryof methane gas on Mars today. Such gas could originate from eithermethane-burping microbes or non-organic geological processes, but so far nosigns of life have turned up as the culprit. A recent study showed that methanedisappears from Mars within less than a year — another sign that somethingmust be constantly creating the methane on the red planet. But now researchers may have a geological, rather thanbiological, answer. Hydrothermal processes with warm liquid water can chemicallyinteract with rocks in a way that produces methane, and the recent LeightonCrater study has laid out strong evidence of hydrothermal systems having atleast existed on Mars. A triumph of the geological explanation does notautomatically rule out the chances for life, said Michalski, who coauthored therecent study with Niles. That's because hydrothermal systems would make theunderground Martian environment an even more attractive-looking place for lifeto hide out. 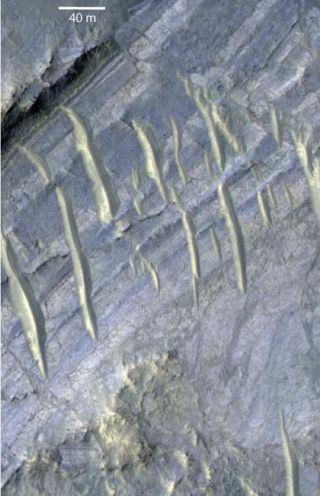 "That is what's cool about Martian methane; it eitherformed organically or in an environment that's conducive to habitability,"Michalski told SPACE.com. Finding out more about the Martian underground has been difficultbecause of a volcanic upper crust that hides what lies beneath. The LeightonCrater itself sits just southwest of a giant dormant Martian volcano namedSyrtis Major, between the northern lowlands and the southern highlands. If researchers can find other craters that provide morewindows into the underground scene, they could confirm a sneaking suspicionabout carbonates being spread across a large region of Mars. Such mineralscould prove invaluable for their record of water's history that dates back tothe warmer, carbon dioxide-rich period of ancient Mars. "The difficulty with Mars is we only see the surfacelayer for a long time [because of a lack of plate tectonics]," Michalski explained. "The best way to look at the deeper part of the crust is to look at impactcraters several kilometers down." Future robotic missions beyond the Mars Science Laboratory,NASA's SUV-sized rover slated to launch in 2011, could also target areassimilar to the Leighton Crater so that they can study the chemical makeup ofthe rocks in detail. Meanwhile, the Mars Reconnaissance Orbiter's instruments —the Compact Reconnaissance Imaging Spectrometer for Mars and High ResolutionImaging Science Experiment — continue to pay off for researchers more than fiveyears since the probe launched. "These missions are part of a big group effort,"Michalski said. "Even though there are just two authors on the paper, wenever want to give impression that we're working alone."